Bluecoats climbed to the top on day one of the 40th anniversary DCI Eastern Classic in Allentown, Pennsylvania on Friday night, setting the bar high for the start of the 2016 DCI World Championships next week in Indianapolis. With a score of 94.625—its highest so far this season by more than a point—the Canton, Ohio corps managed to notch its seventh straight win. Crawford said the corps’ success this season is directly correlated to staying focused and being comfortable with trying new things. “We have kind of had to battle complacency,” he said. “At the beginning we weren't really sure how DCI would take what we were doing and how the community was going to react to the different uniforms and the different show, but I think as the season has gone on we have realized that people like it. Blue Devils kept things close while taking second place with a score of 94.275, just over three tenths of a point behind the Bluecoats. The California corps will look to pace itself as it heads into Indianapolis eyeing the opportunity to attain a record-setting 18th World Championship title. “We’re looking forward to hunkering down in Indianapolis, recharging the batteries, and getting that final push—It’s going to be golden,” Waggoner said. In third place, members of the Blue Knights (88.650) shone under the stadium lights with their production “The Great Event.” The corps’ closest competitor the last few weeks, Phantom Regiment, will perform tomorrow night. The Academy (4th, 85.550) has proven itself as an extremely viable contender to present its show “Drum Corpse Bride” as a first-time finalist at the DCI World Championship Finals next Saturday in Indianapolis. Friday marked just the second time this summer that the Academy has finished ahead of the Madison Scouts (5th, 84.150). The 1.4-point gap in Allentown is an almost complete reversal of the finish between the two corps Wednesday in Pittsburgh, where the Scouts held a 1.75-point lead. Members of the Troopers (6th, 81.825) and Colts (7th, 79.900) continue to chip away at the competition, both corps looking to setup a solid Championships placement. Spirit of Atlanta (8th, 75.250) and Seattle Cascades (9th, 72.550) both improved their scores from their last competitions on Tuesday in Centerville, Ohio (+0.8) and Monday in Charleston, West Virginia (+0.4) respectively. Pioneer finished in 10th place with a score of 66.425, presenting a suspenseful retelling of the story of Saint Joan of Arc. Performing in exhibition on Friday night was Cadets 2, a program of the Allentown-based Youth Education in the Arts, the parent organization of the Cadets. The corps, which competes on the all-age Drum Corps Associates circuit, had one of its best seasons ever in 2015, finishing in second place at the DCA World Championships in Rochester, New York. 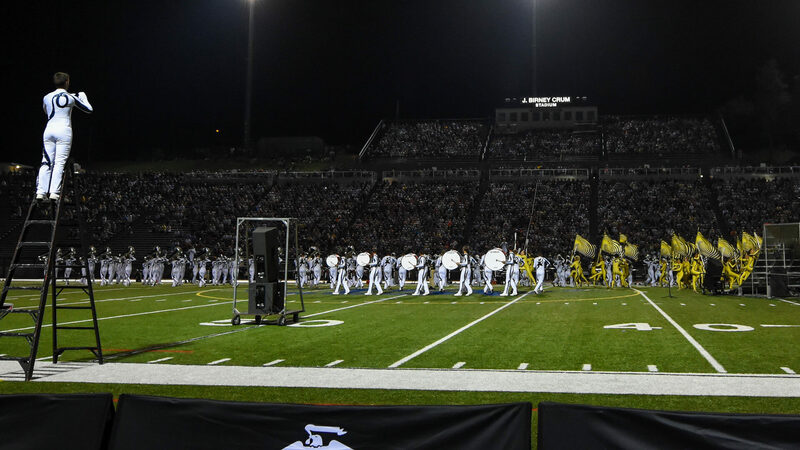 The second day of DCI Eastern Classic competition will kick off tomorrow evening at 6:30 p.m. ET. With the same panel of judges from tonight on hand for Saturday, placements from Allentown will factor into the seeding of corps coming into the DCI World Championship Prelims next Thursday.